I’ve had plenty of discussions in my group of film nerd friends about the death of the American detective movie. There’s just not a huge demand for them anymore. We’ll have our mysteries in the form of television. Ditto with our serial killers. The gist: A killer is striking down people randomly throughout California, in different police districts. It’s the 1960’s, so this is already scary and unheard of. But even more scary is the fact that this killer is blatantly flaunting his murderous acts. He’s sending letters to the newspapers, threatening that he will kill more people if his manifestos are not published. This intrigues Robert Graysmith (played adorably by Jake Gyllenhaal), a cartoonist working with the paper who starts to compile his own investigation into who the killer may be. It starts out little by little. One cod cracked here, one slipped clue there. But when the police and even reporters start losing interest in investing the crimes, Graysmith realizes he may be the only prayer for the case closing. What I “learned”: There really is more than one way to write a crime movie. The main challenge is that you have to be clear about what kind of crime movie you are. Zodiac starts out in such a way that you think it’s going to be a traditional whodunit. But a little over halfway through, as the characters become less afraid of the killer, you realize that this isn’t that kind of crime movie. It’s something different and new: A study of how a crime can affect people. If you’re part of the team investigating who’s behind a horrific death, it’s going to invade your life in some way. Same if you’re writing about it, or hearing about what the killer plans to do next. 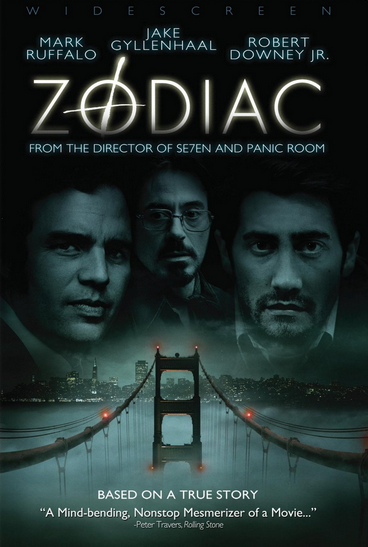 While it would have helped Zodiac to be a bit more clear about what it wanted to be, I applaud it for trying to be different. Maybe having crime stories being told everywhere is forcing people to be creative with how they’re told. Whatever the reason is, I’m all for it. See this movie if you like: Crime stories with realistic pacing. I’ve definitely heard that complaint in terms of police procedurals, where people feel that they’re too clinical to really enjoy. This movie definitely feels like the opposite of shows paced in that way, but still tells the story of a criminal going about doing his thing. It also shows the treatment of a cold case in a way reminiscent of how it may have been treated back in the day. Definitely good for those seeking a change of pace. Avoid this movie if: You need a clear resolution for your crime stories. That’s not an unreasonable thing to want, but it means that certain people will find this movie frustrating. The real Zodiac killer was never caught, and this movie reflects that truth. But the pacing out of this movie, over decades, can take the air out of it. Don’t expect a super-gratifying ending. You can’t go into this movie with the intent of having the mask be ripped off the end. It just won’t happen.